Towards the end of the Second World War, British aircraft flew over Berlin dropping not bombs, but leaflets. A young woman watched as they floated down as if part of some bizarre ticker-tape celebration. She snatched one from the air as the planes droned on and the anti-aircraft guns thudded around her, and found herself staring at a photograph that was almost as surreal as the scene itself. Here were enemy planes that had flown halfway across Europe to fill the air with floating pictures, pictures, she realised, of shoes, mountains of shoes: men’s shoes, women’s children’s shoes. Amidst the broken buildings of Berlin had come this snowstorm of images each with a caption that turned the surreal into the real. 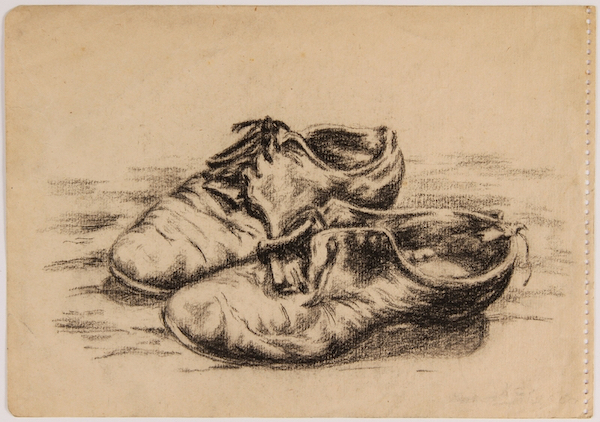 All the owners of these shoes, it said, had been killed in the concentration camp at Majdanek. She had heard rumours of concentration camps, but this was the first evidence of what they might mean. She never doubted the truth of the photographs, never forgot the shock she felt. It was not what was in the pictures but what was not. She felt the pressure of the absence. Even to hold the leaflet in her hand, however, was to risk arrest, and the knowledge of that fact in itself seemed to offer confirmation of its truth. It never occurred to her to dismiss it as simple propaganda, The image and the caption had the power to change her sense of the world, to remove what lingering doubt she had about the forces that had shaped her life. The woman was photographer Inge Morath, third Arthur Miller’s wife.